I entered Trello in place of [company name]. 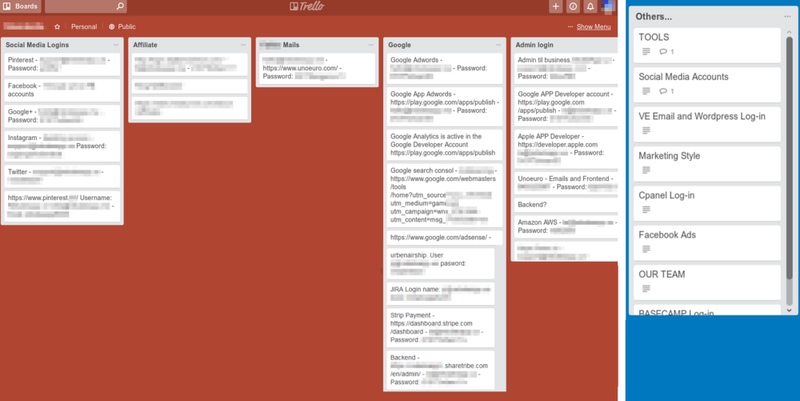 Google presented a few results on Trello Boards. 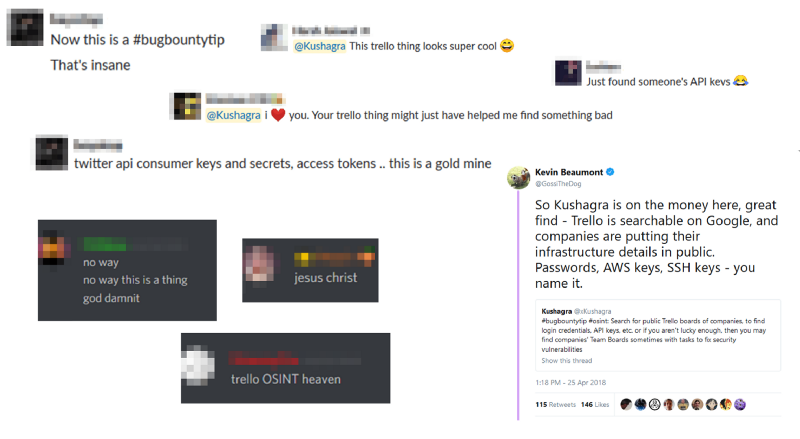 Their visibility was set to Public, and they displayed login details to some Jira instances. It was around 8:19 AM, UTC. After finding this flaw, I thought — why not check for other security issues like email account credentials? Until then I was not focusing on any specific company or Bug Bounty Programs. 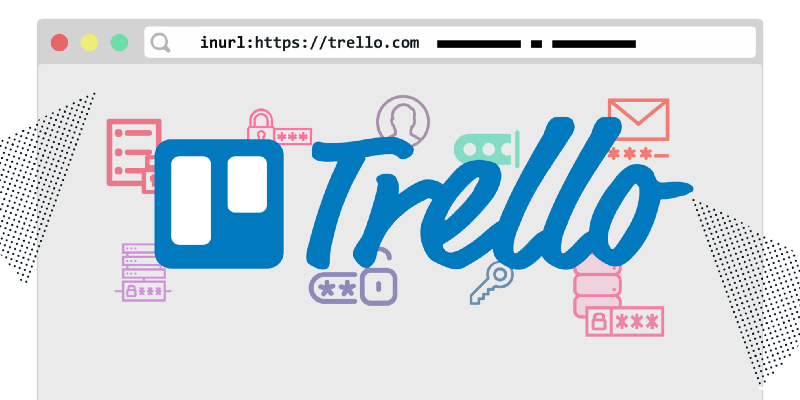 But nine hours after I discovered this Trello vulnerability, I had found the contact details of almost 25 companies that were leaking some very sensitive information. So I reported them. Finding contact details for some of them was a tedious and challenging task. And just the other day, I found a bunch of public Trello Boards containing really sensitive information (including login details!) of a government. Amazing! The Next Web and Security Affairs has also reported about this. In Windows, navigate to Control Panel > Network and Internet > Network and Sharing Center. Choose Manually create a network profile. Uncheck Validate server certificate if the wireless client may not trust the RADIUS server certificate. For the Authentication Method, choose EAP-MSCHAP v2. Uncheck Automatically use my Windows logon on name and password if the computer is not on the domain. b) Select the 802.1X settingstab. If you see a “Profile Missing” error message that says, Your Firefox profile cannot be loaded. It may be missing or inaccessible it usually means that Firefox can’t find or access the profile folder. This article explains what to do if you see this error. Firefox stores your user data and settings in a special profile folder and pulls information from this folder every time you start Firefox. The default profile folder location is under the %APPDATA%\Mozilla\Firefox\Profiles folder, which you can find using these instructions. If you know where your profile is, try one of the following methods to help Firefox find it. Move the profile folder back to its original location. Restore the profile’s original name if you’ve changed it. Create a new profile using the Profile Manager. Give it a descriptive name, click on the Choose Folder button, and then select the profile folder you moved or renamed, before you finish the Create a new profile wizard. Your new profile will not contain settings or user data from your deleted or lost profile. Follow the steps in the Use the Profile Manager to create and remove Firefox profiles article to create a new profile. Click on the Windows Start button or press the Windows key to open the Start Menu. Type %appdata% (as you type, a Windows search will start) and press the Enter key. The hidden AppData\Roaming folder will open. Delete (or rename, for example, to profiles.iniOLD) the profiles.ini file. Note: Instead of deleting the profiles.ini file, you can delete (or rename) the folder that contains it. For example, right-click the Firefox folder and rename it FirefoxOLD. When you start Firefox, a new profile will be created. A key issue system administrators deal with today is keeping client and server computers updated with the latest software patches and security updates. This becomes a cumbersome task when you have to deal with a large environment with many different computer configurations that require many different security updates and software patches. 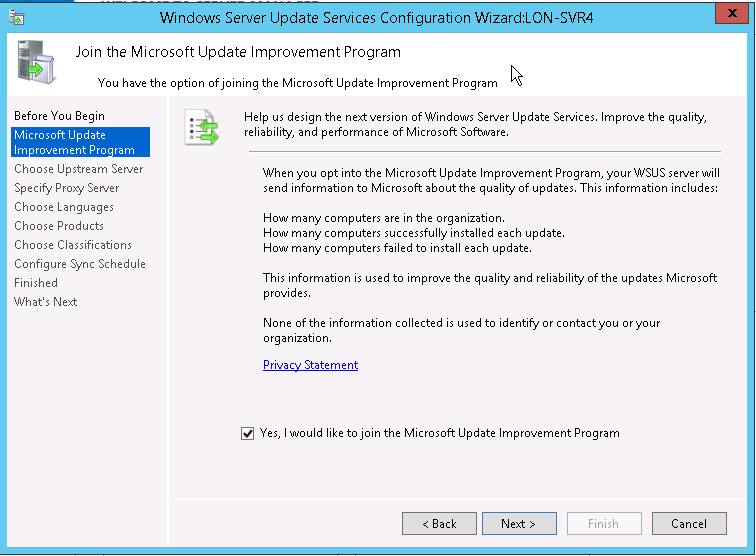 Luckily for us, Microsoft has included a server role in Windows Server 2012 R2 called Windows Server Update Services, or WSUS, to make this task a bit easier to manage. With WSUS, we are able to download and manage a distribution of updates to the proper Windows clients and servers. We can then configure computers to obtain automatic updates from the WSUS server that is pre-approved by the administrator. 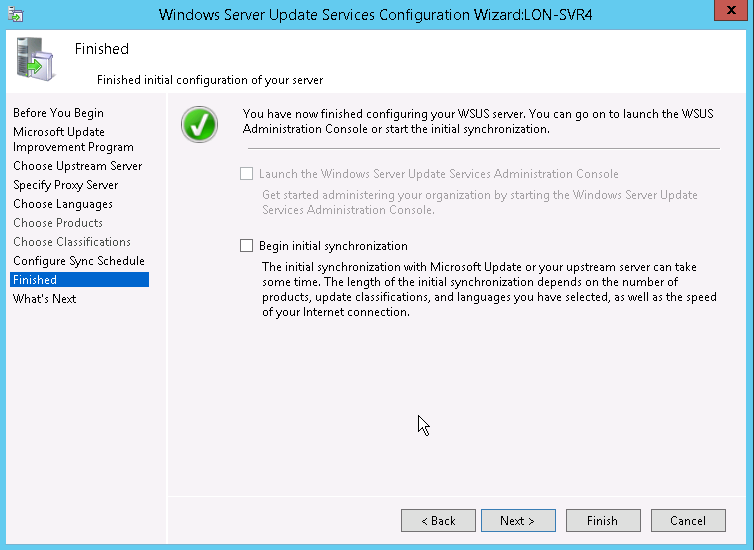 It’s a wonderful feature in Windows Server 2012 R2 and we are going to go through the process of installing and configuring a WSUS server in this blog post! Open server manager, on the dashboard, click on “Add Roles and Features”, then click Next. Select “Role-based or feature-based installation”, then click Next. 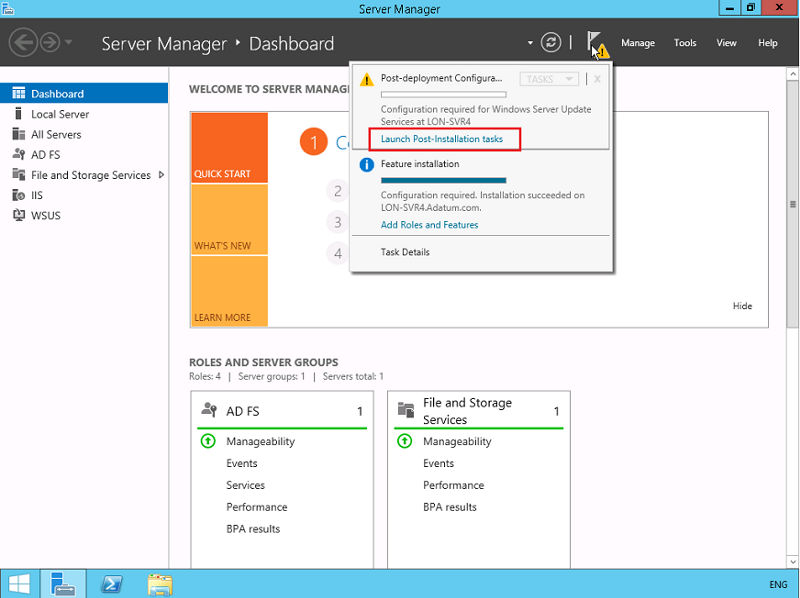 Select a Server or virtual hard disk you wish to install the WSUS role on, then click Next. 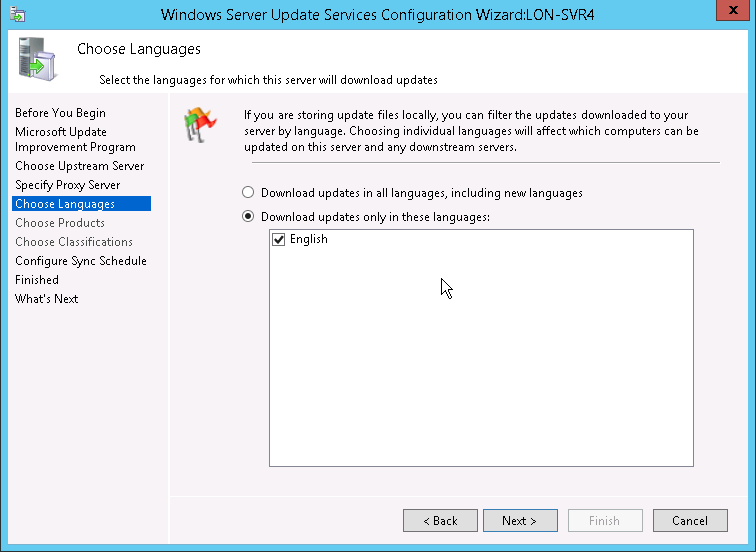 Select Windows Server Update Services, then click Next. On the “Select Features” screen, click Next. On the “Windows Server Update Services” screen, click Next. On the “Select role services” screen, make sure “WID Database” and “WSUS Services” is selected, then click Next. Click Install to start the WSUS role installation process. Once the installation process completes, we can launch the post-installation tasks by clicking on the notification icon on the Server Manager Dashboard as seen below to configure the WSUS server. On the “Before You Begin” screen, make a note of the checklist and make sure you have all the necessary information before you continue. 2. On the “Microsoft Update Improvement Program”, you can choose to send Microsoft information to improve the quality and reliability of updates. 3. 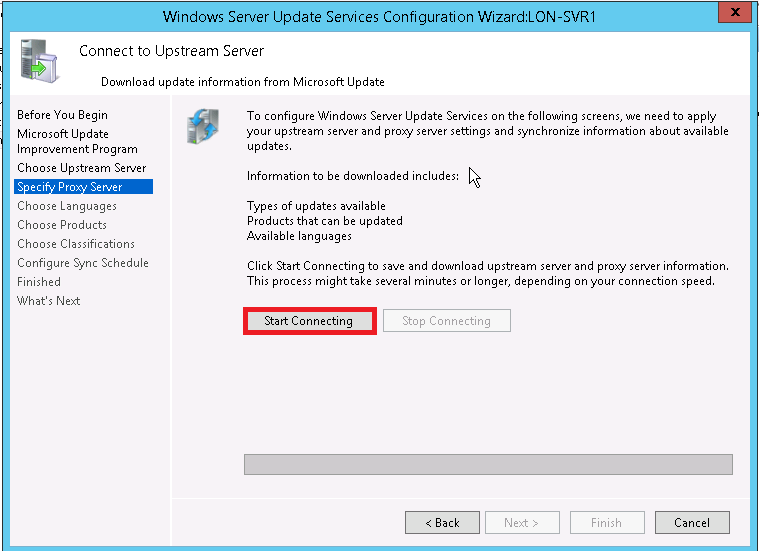 On “Choose Upstream Server” screen, we can choose to synchronize updates from Microsoft updates or If we already have another WSUS server, we can set it to sync from that WSUS server. In that setup, the main WSUS server is called the “upstream server” and the servers that sync with it are called downstream servers. We can also set this up to be a replica of the upstream server, which mirrors the update approvals, settings, computers and groups from the parent. Management is done only on the upstream server. 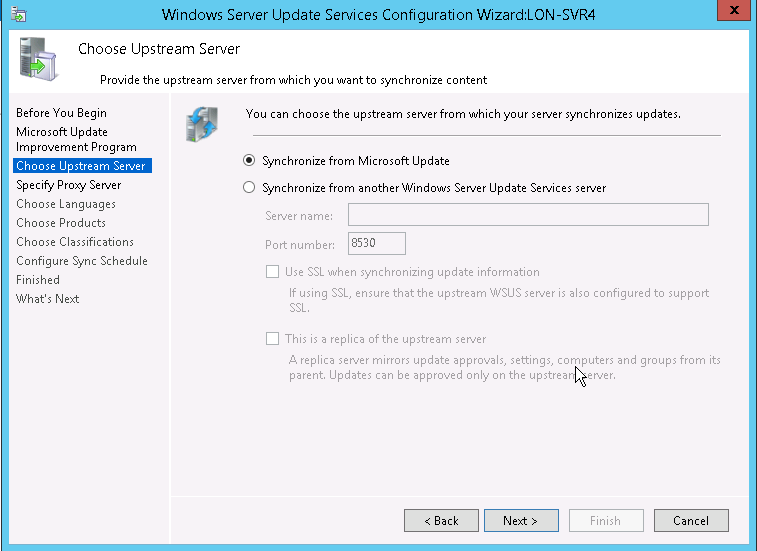 Since we don’t have any other WSUS servers set up, we’ll set it to “Synchronize from Microsoft Update”. 4. 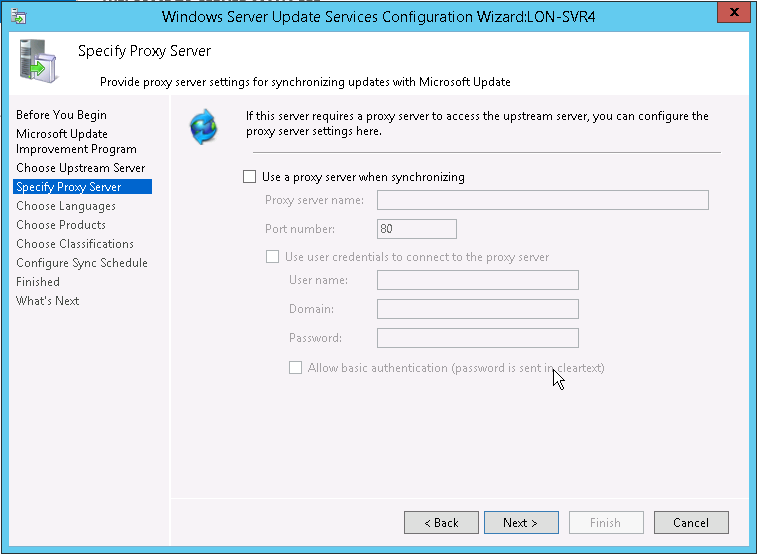 On the “Specify Proxy Server”, you can enter the proxy server information, should your environment requires it. For our example, we do not require a proxy server, so we’ll just click Next. 5. On this screen, we’ll click “Start Connecting” to begin downloading information about the types of updates available, products that can be update and available languages. This process can take a few minutes. 6. On the “Choose Languages” screen, you can select to download updates for specific languages, or updates in all languages, depending on what your environment requires. 7. 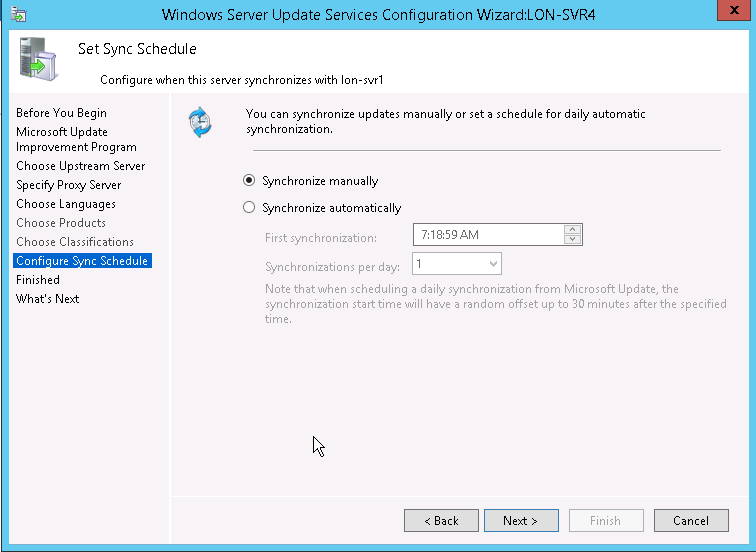 On the “Configure Sync Schedule” screen, we can configure how we want to schedule our WSUS server for synchronization. We can set it to sync manually or schedule it to sync automatically. 8. On the “Finished” screen, we can opt to begin the synchronization by selecting “Begin initial synchronization”. 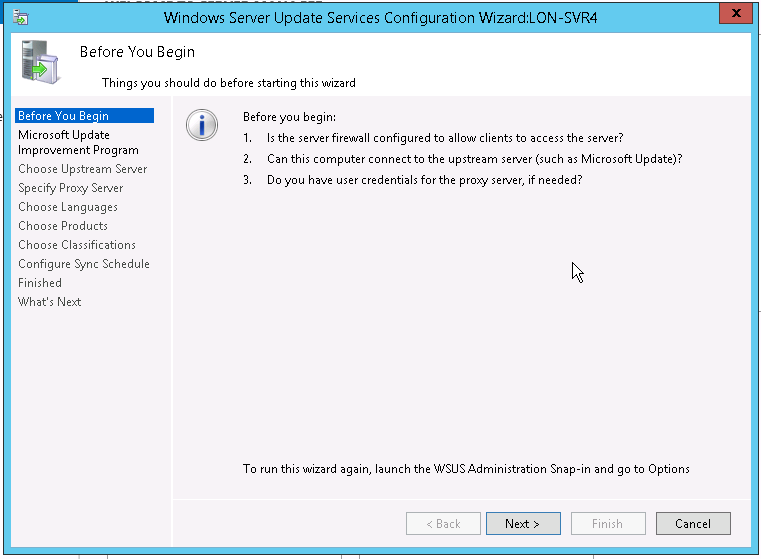 Click “Finish” to begin synchronization and conclude the WSUS configuration wizard. This process can be quite lengthy depending on the number of product updates, languages selected, and your internet connection. The ability to manage updates intelligently and centrally is crucial to the efficiency, reliability and security of any large environment. With WSUS, Microsoft has given us a very powerful tool to do just that. To learn more about WSUS and what it can do for your environment, visit the WSUS MSDNwebsite.